As is, this recipe is not a light one. About 500 calories a slice. 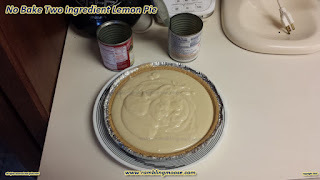 If you're wanting something lighter, and still want to enjoy an excellent lemon pie, use 1/2 the ingredients. It will bring the calorie count down below 300 calories a 1/6 pie slice. But, there was a day I wanted pie. Lemon Pie. I went through my cabinets and didn't find the ingredients I was looking for. Then I got online and found this recipe somewhere. Actually a couple different somewheres, so I won't attribute it to one particular site. 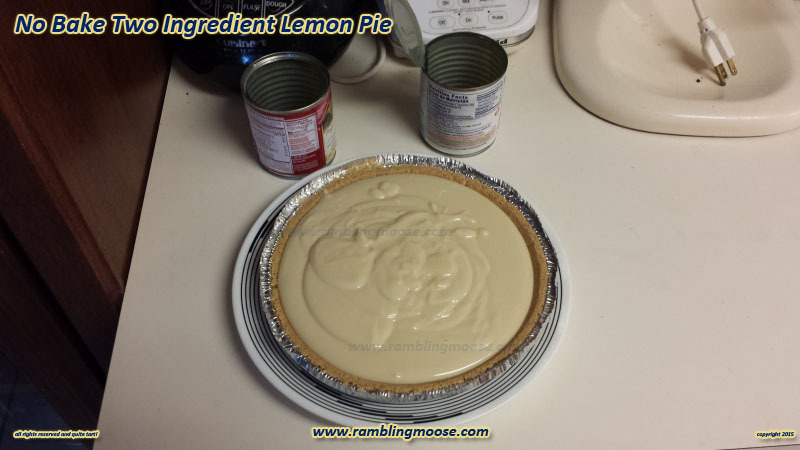 Now, while it was a good pie, the Lemon Juice I used was quite strong, so I will cut back the lemon juice a bit. Maybe 5 ounces instead of 6. Empty two cans of Sweetened Condensed Milk into a large mixing bowl. Lick the stuff off your fingers. After all 2 cans, 14 ounces each, always leaves some goo on your fingers. Add 3/4 cup of fresh Lemon Juice to the mixing bowl. Stir or whisk the two ingredients together until even and smooth. Pour the filling into a ready made pie crust. Serve with Whipped Cream, yes even the canned stuff. Want me to write it out traditionally? 2 Cans (14 ounces each) Sweetened Condensed Milk. 3/4 cup of fresh Lemon Juice. I used the bottled stuff, it was a bit strong so I will cut back next time. To large mixing bowl, add 2 cans Sweetened Condensed Milk. Add 3/4 cup Lemon Juice to the Sweetened Condensed Milk. Whisk until even and smooth. Add to ready made graham cracker pie crust. Chill for 2 hours at least.